The harms of marijuana prohibition have not been borne equally across New York. Communities of color have consistently been the most targeted and injured by the enforcement of marijuana laws. Legalization presents a unique and much-needed opportunity to create equity, economic justice, and restore communities most damaged by this country’s failed war on drugs. 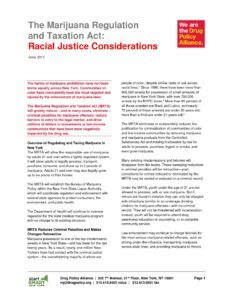 The Marijuana Regulation and Taxation Act (MRTA) will greatly reduce – and in many cases, eliminate – criminal penalties for marijuana offenses, reduce barriers to entry to the legal market, and drive millions of dollars in investments to low-income communities that have been most negatively impacted by the drug war.